Students will be able to identify and use digraphs to complete words. Ask students if they ever have had a chance to cook or bake something. Have students briefly share their experiences. Tell students that just like they mix a bunch of ingredients in a bowl to make something, today they will make a new sound using some sound "ingredients." 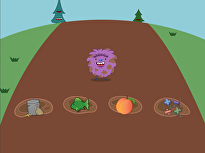 Instead of making a food, tell students they will make a digraph, or a single sound composed of two letters. Show students the mixing bowl, mixing spoon, and letters. Show students the letters “s” and “h”. 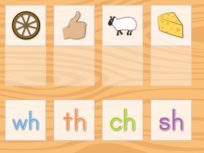 Have students tell you the sounds that each letter makes. 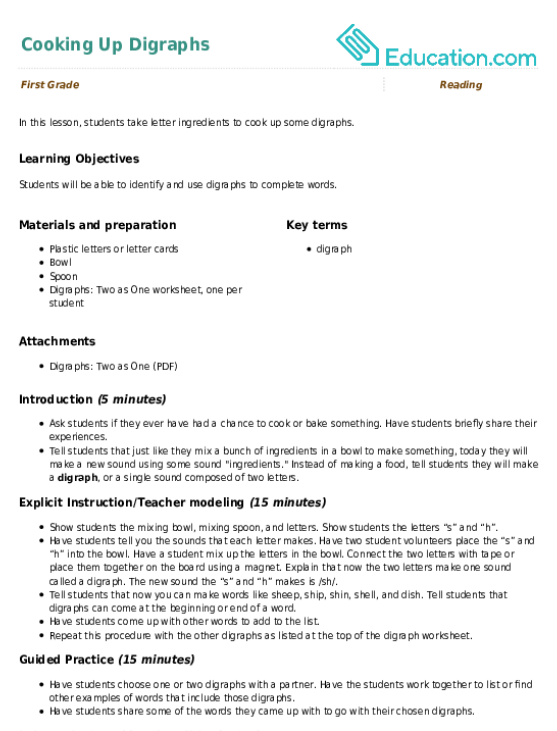 Have two student volunteers place the “s” and “h” into the bowl. Have a student mix up the letters in the bowl. Connect the two letters with tape or place them together on the board using a magnet. Explain that now the two letters make one sound called a digraph. The new sound the “s” and “h” makes is /sh/. 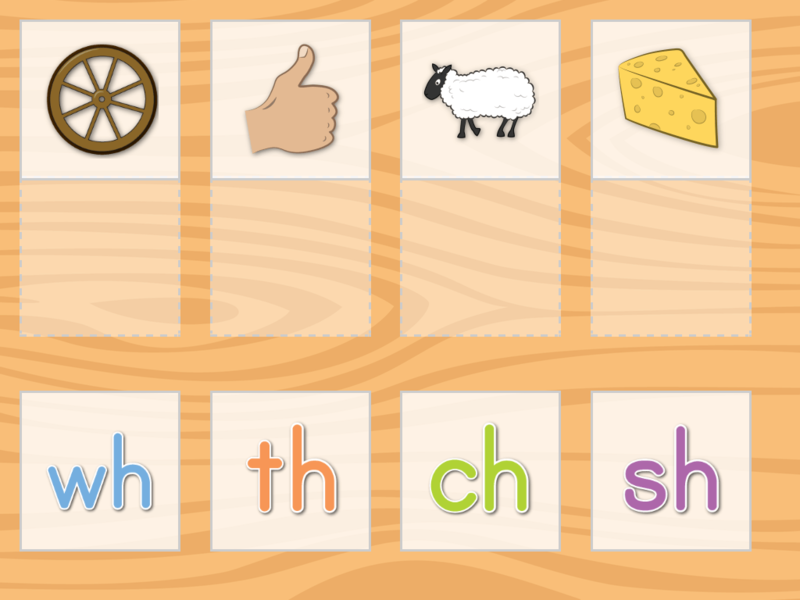 Tell students that now you can make words like sheep, ship, shin, shell, and dish. 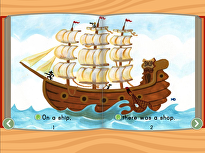 Tell students that digraphs can come at the beginning or end of a word. Have students come up with other words to add to the list. 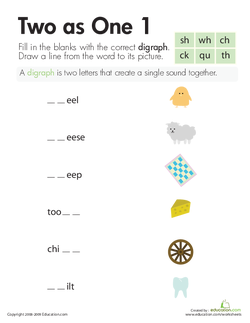 Repeat this procedure with the other digraphs as listed at the top of the digraph worksheet. Have students choose one or two digraphs with a partner. Have the students work together to list or find other examples of words that include those digraphs. Have students share some of the words they came up with to go with their chosen digraphs. Have students independently complete the Digraphs: Two as One worksheet. Enrichment: Encourage students to search for digraphs in the environmental print around the classroom or in their independent reading books. Have students list these digraphs and share them with a partner. Support: For students in need of support, provide a list of words containing digraphs. Have the students highlight the digraphs and practice making the sound. Circulate as students work in pairs on the worksheet. 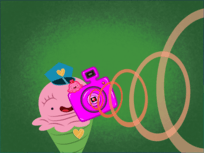 Have students make the sound of the digraph for you. Ask students to identify the digraph within a word. Collect and assess the worksheet for mastery. Have students share the words they made by matching the digraphs on the worksheet. Have students define and review what a digraph is. 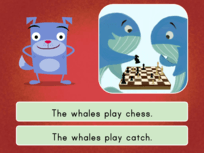 Go over blends and digraphs with your first grader with help from this printable practice test. Engage your students in using and understanding digraphs as they come up with words that contain common consonant digraphs in this fun activity. If your child is learning about digraphs, here's a great list of words ending in "ch" to help her practice her phonics. Teach your child about digraphs with this list of words ending in "sh".